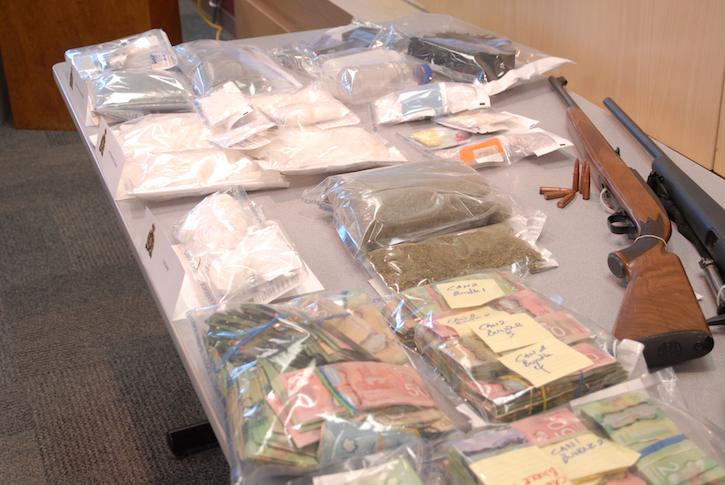 Seven people from around the Okanagan have been arrested following an alleged drug operation raid in West Kelowna. Dec. 9, 2016 8:00 p.m.
Kelowna RCMP say they have shut down a large alleged drug trafficking ring, taking an estimated 342,000 doses off the street. Cpl. Jesse O’Donaghey says during the course of the two-month investigation, police gained information to indicate that a West Kelowna-based drug operation was responsible for supplying drug dealers and drug houses primarily in the City of Kelowna. “RCMP have gathered intelligence which suggests that a significant amount of the illicit drugs that were being sold on the downtown streets of Kelowna, were being supplied directly by the West Kelowna drug operation,” says Sgt. Alex Lynch, head of the Kelowna RCMP Street Enforcement Unit. On Nov. 30, the Kelowna RCMP Street Enforcement Unit, with the assistance of RCMP Police Dog Services, the Kelowna RCMP Downtown Enforcement Unit and the West Kelowna RCMP, executed two search warrants at separate properties in West Kelowna – Smid Road and Old Ferry Warf Road. “We strongly believe these arrests will have a notable effect on the immediate availability of illicit drugs in the Central Okanagan,” adds O’Donaghey. Terry Weninger, 44, and Robert Colbon, 59, of West Kelowna, along with Darcy Lenko, 52, of Penticton, each appeared in court and have since been remanded into custody. Police say each have been formally charged with multiple counts of possession of a controlled substance for the purpose of trafficking. Lance Wust, 42, of Kelowna has been charged with possession of a controlled substance. After his first appearance he was released by the courts on strict conditions. The remaining individuals arrested, a 52-year-old West Kelowna man, a 22-year-old Vernon man and an 18-year-old Kelowna woman were released from police custody. Each face potential charges and are expected to appear in court at a later date. Anyone with any additional information is asked to contact the Kelowna RCMP Street Enforcement Unit (SEU) at 250-762-3300.